Others have written about the "tipping point" where a human behavior suddenly becomes unstable big changes happen. The sudden disintegration of the Soviet Union is a good example. The author illustrates the uncanny association of physical state changes (mentling ics, say) to similar human behavior changes. Very interesting and well written. A super introduction to complexity science, econophysics and network science — everything in the book is interlinked well together. The book itself follows the subtitle very well — one thing leads to another. It is an easy read (very few, if any formulas/equations/math) but NOT over-simplified. The book assumes an educated reader. I often recommend this book to my clients who are interested in both Complexity Science and Network Science. This book was offered me and - it was hit on the nail. Philip Ball is obviously a very experienced writer. This book - the very first (but definitely not the last)I read from him - is essential for everyone who is interested in the problems of today's world. Since he covers wide range of subjects, the reader can obtain information about seemingly unconnected subjects and put a larger picture together. The greatest advantage of this book is that the reader can learn a lot about very different things without the need of shopping around for books specialized in the matter in question. Each chapter goes into depths easily understandable by laymen with providing all necessary information. 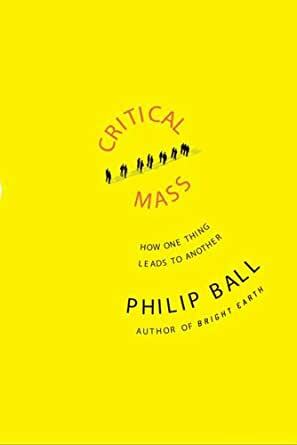 A great book, the opinion of the Economist summarizes it the best: "Critical Mass is an intellectual roller-coaster". I would like to say that this book is the basis for Asimov's "psychohistory". It isn't, but it is a great collection of social systems and ideas presented as physical and mathematical models. Starting with simple phyiscal models such as spin glasses and ending with game theory, this book is a treasure of lucid explanations about how these models apply to the system being modeled and their limitations. I found this a very interesting read and I appreciated that the author does not breathlessly hype the models, but explains the reasoning behind each and details the results, where they work and sometimes where they fail. 1.0 颗星，最多 5 颗星Facts.mixed with gross errors. The book is a superb example of layering errors from one field onto another. The facts emphasize misunderstandings. Pure fiction.